Trigger Pull: Short with only a little bit of take up. The release is light and crisp. The blowback action resets the internal hammer/striker with each shot for that true single-action trigger. It’s also nice that the trigger has a working trigger safety. Accuracy: I have not shot the KWC K17 BB Pistol yet so I can only quote what KWC is saying in terms of FPS, which is around 330. For a full blowback action steel BB gun like many other KWC blowback air pistols, this is about what you are going to expect. It may sound low but 300+ FPS is fast enough at 30 feet to only notice a slight delay from the time you press the trigger till the steel BB hits the target. You can expect to put holes in pop cans all day long. In terms of accuracy, I should be able to get at least a 2 inch, 10 shot grouping from 30 feet down the range if the pistol is on point for me. Build Quality: The KWC K17 feels really good. I’m going to say it’s probably one of the nicest KWC CO2 blowback pistols I have had in my hands to date. The finish is really nice, the polymer frame is flawless, and fit is really good with nice, tight tolerances throughout. Realism: The K17 BB Pistol is super realistic in terms of looking and functioning like a real steel gun. All the parts function as you would expect them to, including the ability to field strip, which gives you easy access to the hop-up. 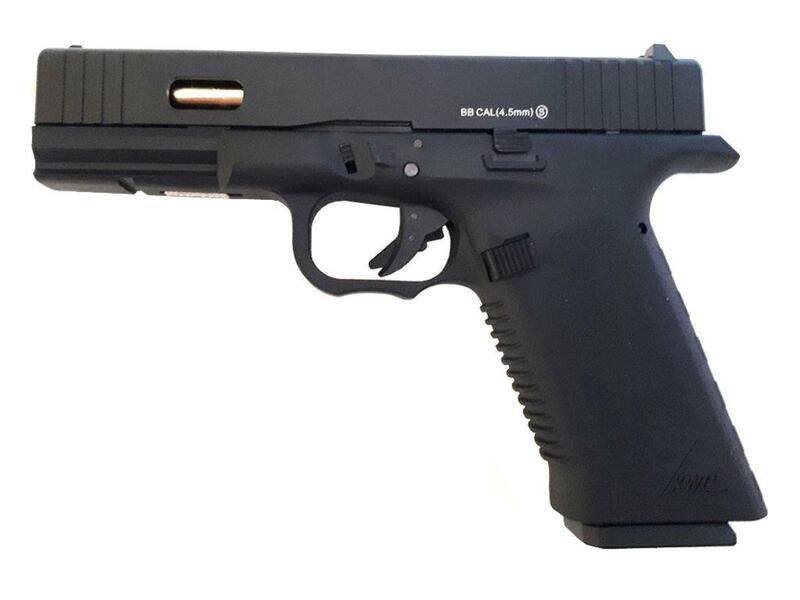 In terms of being a replica, it does look similar to a Glock with some differences like the trigger guard, slide cut-outs, extended beaver tail, and a straighter pistol grip. Comments: I really like the KWC K17 CO2 Blowback BB Pistol. It may even be one of my favorite CO2 blowback BB pistols from KWC to date. That will be determined by how it shoots, of course. The only thing I’m not a huge fan on is the gold barrel but that’s more of a personal preference. You may really like the gold bling! I could easily polish the barrel to more of a stainless finish if I wanted to and maybe I will. 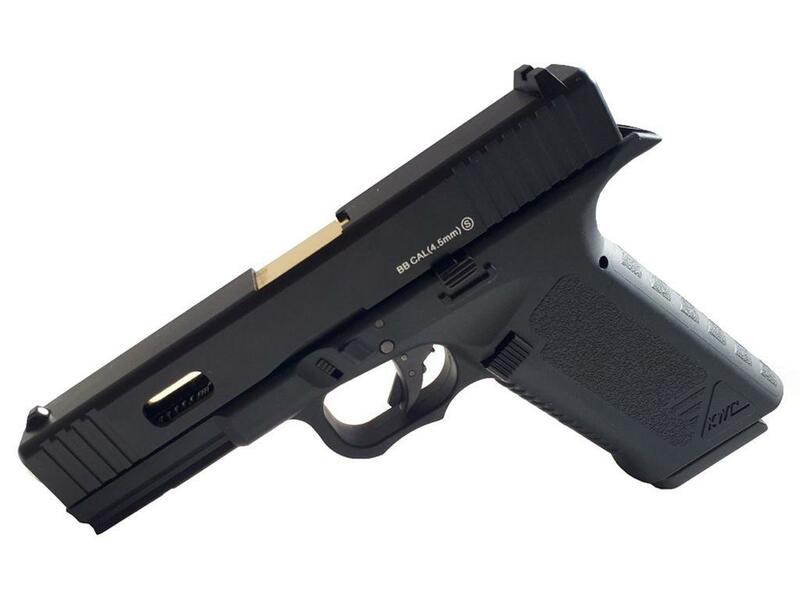 All in all, if you’re looking for a modern pistol design then the K17 is going to fit the bill. If you’re more into airsoft then you can get the airsoft version of the KWC K17 CO2 Blowback Pistol in our online store! -Good weight with very solid feel to it. -Full blowback action will produce good recoil effect. -Full size drop out metal magazine. -Short and light single action only trigger. -No ugly markings or warnings. 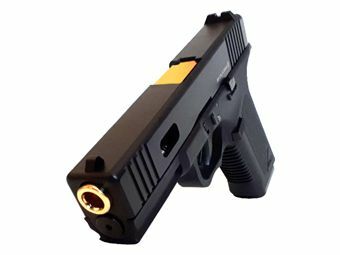 -Has some bling with the gold barrel and vented slide. -Field strips like the real steel version. -White dot sights front and back. -Adjustable hop-up to adjust for elevation as needed. -Working trigger safety along with serial number safety. -Full blowback action will produce lower fps and use up more CO2.